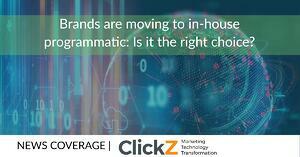 Nearly 40% of advertisers now execute in-house programmatic, new report shows. What's behind more companies moving this way, and is it the right choice? For years, programmatic has been a must-have in the ad industry, offering a quick and typically cost-effective avenue for automated ad buys and placements. While this advertising tactic has been historically handled by media agencies, brands are more and more looking to bring this branch of their overall ad strategy in house. In fact, a new IAB report shows nearly 40 percent of advertisers execute in-house programmatic trading and even 50% of publishers now have an in-house model.